Decomposition of branch litter of four angiosperm and one conifer species was studied over a two-year period. Litter species and the corresponding forest type are: (i) Shorea robusta, sal forest at 329 m; (ii) Lyonia ovalifolia, mixed-pine broadleaf forest at 1 350 m; (iii) Pinus roxburghii, pine forest at 1 750 m; (iv) Quercus leucotrichophora, mixed oak-pine forest at 1 850 m; and (v) Quercus lanuginosa, mixed oak forest at 2 150 m. The weight loss ranged from 44–89%. Litter moisture and air temperature had significant positive effect on decomposition. The decomposition rate decreased with an increase in altitude and was inversely related with lignin content. 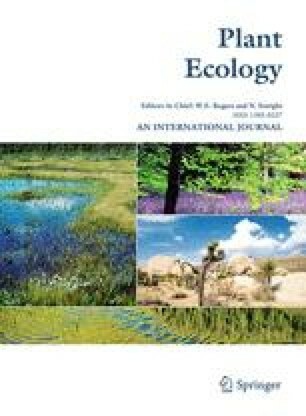 Linear combinations of lignin content with rainfall and with temperature indicated significant interactive influence on decomposition. Authorities for plant names are given in Table 1. We gratefully acknowledge financial support from the Department of Science and Technology, Government of India.